Full Day Offshore, Inshore, or Tortuga Island Charters include: Snacks, lunch, soda, beer (24 per trip) and bottled water, as well as all bait, premium Okuma tackle & equipment, state of the art Raymarine electronics. Normal departure time is 7:00 am, with the boat returning to port at approximately 4:30 pm. Half-Day Inshore Charters: These trips typically leave the marina around 7:00 am and return at around 1:00 pm in the afternoon, OR depart around 12:00 pm and return around 5:00pm. Due to their short duration and limited range during half days we do not actively target Billfish. That is not to say they are not caught during half day trips but, they are an infrequent catch therefore if you want to catch a Sailfish or Marlin we ask that you please consider a full day trip. 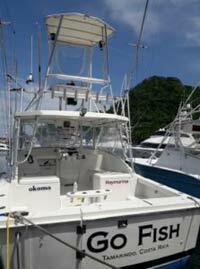 Soda, beer and bottled water are included on half-day charters. Full Day (4 anglers): $1395, Inshore or Offshore. Extra Angler: $50, 6 anglers max. Half Day (4 anglers): $1195, Inshore only. Extra Angler: $50, 6 anglers max. Full Day (4 anglers): $1295 Inshore or Offshore. Extra Angler: $50, 6 anglers max. Half Day (4 anglers): $1095 Inshore only. Extra Angler: $50, 6 anglers max. 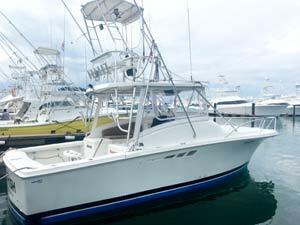 Full Day Tortuga Island (6 passengers, no fishing): $1095. NOT included in your charter cost is your fishing license which must be paid directly to the government agency INCOPESCA either in cash (at the marina entrance the morning of your charter), or via this link. CREW TIPS: 20% is customary and SHOULD BE BASED off of our rates above. Tips should be paid directly to the captain who will divide it with the other crew members. Booking and Cancellation Policy: Pelagic Pursuits CR requests a $500 deposit per day of fishing at the time of booking to secure your reservation. Packages will require additional deposits. Reservations not secured by a deposit are subject to cancellation without notice. Your balance will be due 7 days prior to your first day of fishing. Balances can be paid by credit card, or PayPal. Payment Methods: Credit Card or PayPal payments are accepted by Pelagic Pursuits but subject to a 2.5% convenience fee, no Costa Rica sales tax is currently chargeable on fishing charters. Cancellation Policy: Reservations for fishing, snorkeling and boat cruises cancelled withing 60 days of scheduled trip are subject to loss of deposit if we can't re-book the dates with another party. Reservations cancelled within 45 days of scheduled trip are subject to the total cost of the charter if we can't re-book the dates. 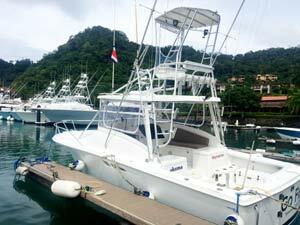 In the event that a charter is cancelled by Pelagic Pursuits CR, all monies will be returned regardless of time frame. Charters that return early based on the clients request will not be refunded. If you anticipate any problems or have any concerns after booking please contact us as soon as possible. Additional restrictions may apply to cancellations for accommodations. Vessel Trouble - Please note occasionally boats can have mechanical problems, in this situation Pelagic Pursuits reserves the right to substitute the boat with a replacement of equal quality or issue a credit for a future trip. DUE TO OUR INSURANCE REQUIREMENTS, WE CAN NOT ALLOW INTOXICATED PASSENGERS TO BOARD ANY BOAT. WE WILL PROVIDE LOCAL BEER ON ALL CHARTERS AT THE RATE OF 18 BEERS PER TRIP. ANGLERS ARE WELCOME TO BRING ADDITIONAL. SPECIAL PACKAGES: Reservations for Special Packages require payment of a deposit at the time of booking to reserve your date(s). Reservations not secured by deposits are subject to cancellation without notice. Las Brisas Resort and Los Suneons resort accommodation rates are subject are subject to change without notice and also subject to 13% Costa Rican sales tax. All Credit Card and PayPal transactions are subject to a 2.5% convenience fee. Other deposits and / or credit card information may be required for fishing packages including accommodations. Pelagic Pursuits Costa Rica, and Go Fish are trading names of Hidden Woods S.A. - A limited liability Costa Rican Corporation.